Professional & Local Organic Web Site Search Engine Optimisation (Website SEO) Analysis, Checker & Audit Report in Tamworth, Lichfield, Sutton Coldfield, Nuneaton & surrounding areas. We offer professional & local website search engine optimisation (seo), primarily in Tamworth, Lichfield, Sutton Coldfield, & Nuneaton, but potentially (given the nature of the internet) anywhere in UK or overseas. Our SEO services include full analysis of your website (including its structure, navigation, content, and back-links), for your chosen keyword/phrases, and for your chosen competitors websites and rankings. Whilst we have no doubt this service will significantly increase the visibility of your SEO website in all the major leading search engine rankings (particularly based on a niche market), we cannot make any guarantees (and please be very weary of anyone who does preach you a guarantee) as to specifically how much your rankings will be promoted (albeit first page on Google for one or more chosen keywords/phrases is typically achievable for the majority of our clients). Looking for Web Design SEO in Lichfield, Nuneaton, Birmingham or Surrounding Areas? In essence the science of Website / Web Design SEO is highly competitive, with everybody demanding the pole position for anything remotely related to their business, which is typed into a search engine. Unfortunately this is not how Website / Web Design SEO / Rankings work, however there are plenty of businesses out there looking to profit from ‘very’ short term results using either white-hat or black-hat methods in an attempt to manipulate the search engines and get fast high ranking results. We do not condone this method of SEO practice on the basis that any extraordinary, rapid ‘high ranking’ results are often short lived, and the underhanded techniques used are more often than not soon identified by the search engines, and the end result is that your website will be demoted in ranking or even blacklisted & dropped completely from the index. We use trusted SEO analysis & report tooling, and through meticulous analysis of all SEO aspects of your site, we will manually apply SEO tuning to your website pages. This will (as with anyone else) require us to have access to your website source-code, so that the identified changes can be applied. The changes we apply are carefully managed and are performed based on the recommendations of the latest SEO Toolset analysis, on an ‘extremely educated’ trial & error basis, with the final benefit of some of the optimisation sometimes not visible for 2-3 weeks, or whenever your website is next re-indexed by the major search engines (eg. Google, Bing. Yahoo). 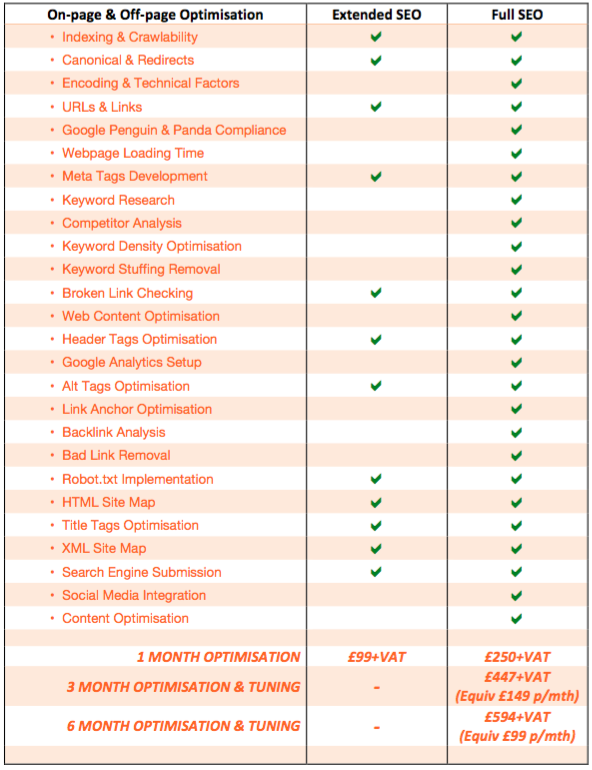 We offer 2 levels of Search Engine Optimisation (SEO), EXTENDED SEO, and FULL SEO. Trust Tamworth Web Design for local & professional search engine optimisation. We specialise in Google Search Engine Optimisation, SEO web design & local SEO services and offer professional SEO services, website analysis, checker, and audit report(s) for small businesses. For more information on how we could help you increase the visibility of your website / page on the internet (usually to google first page), and get better rankings in Google, Bing and Yahoo – get a website SEO / Search Engine Optimisation quote from your Tamworth Web Design SEO specialist today. Tamworth Web Design, your #1 choice for SEO Web Design & Professional Organic Local Website / Web design Search Engine Optimisation (SEO) Analysis, Checker & Audit Report in Tamworth, Lichfield, Sutton Coldfield, Nuneaton & surrounding areas.